Three different classes of cells are known as white blood cells, the most numerous of which are called granulocytes. 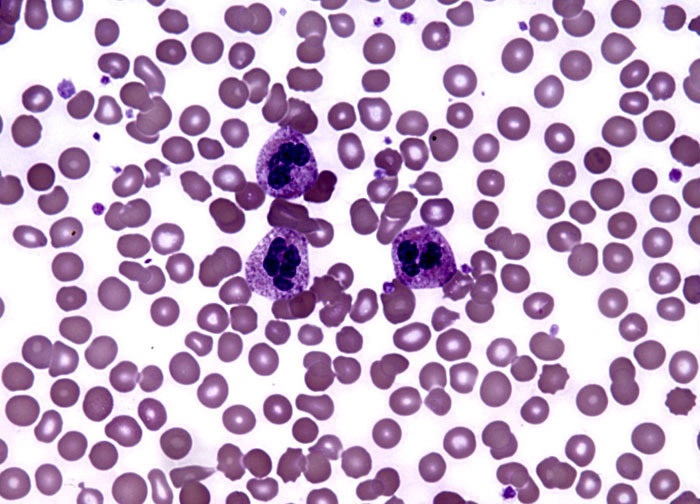 Granulocytes are intricately involved in the body’s natural inflammatory response and are further subdivided into three basic types: neutrophils, eosinophils, and basophils. The vast majority of granulocytes in the human body are neutrophils, the cells comprising as many as 80 percent of the white blood cells at any time. Billions of neutrophils, each of which usually exhibits a diameter of approximately 12 to 15 micrometers and a lobed nucleus, are produced in the bone marrow of a typical adult each day. The body generally maintains a portion of these cells (termed the marginal pool) in a relatively inactive state in the blood vessels. The rest of the cells are either present in tissues or are being rapidly circulated in the bloodstream (termed the circulating pool). Neutrophilia, a condition that is characterized by an increased number of neutrophils in the blood or tissues, can sometimes occur do to a significant number of neutrophils shifting from the marginal to the circulating pool, in which case it may be referred to as shift neutrophilia. The condition can also be related to an overall increase in the body’s neutrophil count, sometimes referred to as true neutrophilia.